Gmail on Wednesday received its first major redesign after five long years. Apart from the design overhaul, Google has added a ton of functionalities to both the Web as well as its mobile interface. Email shortcuts, reply ‘nudges’, smart reply, native offline mode, are only some of the features that Google has included in the Gmail makeover. While the biggest changes appear to have been implemented on the website, the Gmail app is also getting some new functional features. One of the highlights is that Gmail for Android is rolling out a ‘Snooze’ feature to match the revamped Web interface. While the report said that a new version of the Gmail app with version 8.4 is available in the Google Play Store, and comes with the new feature. However, Gadgets 360 found the feature available on the previous 8.3.25 version as well. Interestingly, in another report, Android Police says that the Gmail app is getting another new feature called ‘mark unread from here’. While the Gmail Web version already has the option to ‘mark unread from here’ on individual emails, the feature was missing from the app. As per the report, tapping on the overflow button in an email will get you the new option to mark it unread. When you go back to the thread, you will get a small marker indicating the emails that are hidden and the unread emails below it. 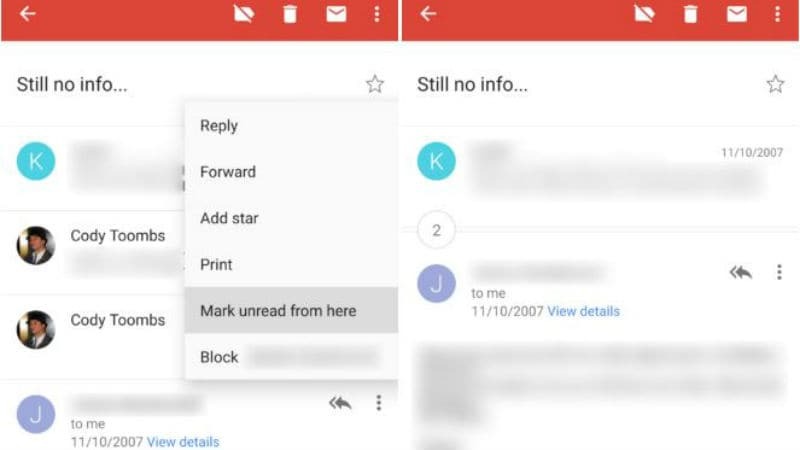 Meanwhile, a teardown has revealed that the Gmail app appears ready to add the ability to customise swipe gestures on email conversations. Currently, the swipe action is only available for deleting and archiving individual emails. Once the new feature is live, you will have the option to select one of five actions – Delete, archive, mark as read, move to, and snooze, as per the report. Also, each direction can be mapped to different commands. However, it is unclear at the moment, when this new feature will be available in Gmail for Android.